Crispy, crunchy pickles in a hurry! 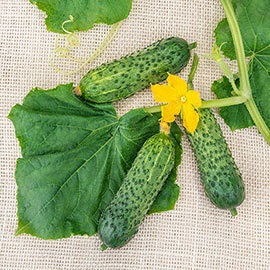 Gherking is the perfect pickler, bearing attractive, 3-5 inch cucumbers that are crisp and delicious. Plants are disease resistant and vigorous-they produce plenty of green-skinned, highly spined fruits for plenty of pickles. Delicious for fresh eating, too, and are great for salads, sandwiches and relish trays. For better production, pick fruits regularly. 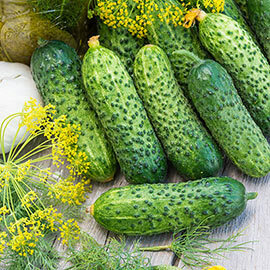 Resistant to downy and powdery mildew, which are two of the biggest threats to cucumbers. Gherking has an upright, vining habit. No pollinator required. 65 DAYS. Soil Requirements: Well-drained, sandy, loam soil.